Welcome to CART Racing Headquarters! We are a small but active community centered around one of the best racing simulators ever released: Indycar Racing 2! On our website you can download a large amount of carsets and tracks released over the years, as well as numerous tools and utilites to improve your game. If you have a question about the game, for example how to run it on modern computers, you are of course very welcome to join our forum! 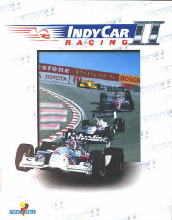 Released by Papyrus in 1995, Indycar Racing 2 (also known as ICR2) simulates the 1995 season of the Indycar World Series with realistic car handling and competitive racing. Now more than 2 decades old (and approaching its 25th birthday!) the game can still count on an active community creating new carsets and tracks for the game on a regular basis. With specific tools created by the community itself, very realistic and beautiful carsets are now available. And using the tools that Papyrus originally used to create the NASCAR Racing 3 tracks, wonderful and very detailed tracks can be built from scratch. All these great additions to your game can be found in The Archive. Take a look at the Track tutorials if you would like to learn how to build your own favourite fantasy or real life tracks from scratch. The game saw a couple of re-releases, for example upgrading it from a pure DOS game to a Windows specific version, changing the name to CART Racing in the process to reflect the real world changes at the time. There was also a special rendition version that took advantage of rendition video cards, as well as a Mac release. Getting the game to run nowadays can be a challenge, but thanks to wonderful programs like DosBox you can run it from newer Windows versions, or even from Linux if you want to. If you have always been a fan of ICR2, chances are you might still have the disc somewhere. If you don't, then finding a hard copy of it will be very difficult. You should however be able to find the full game on many abandonware websites. What you will find there will mostly be the oldest DOS version. But this version can easily be patched to a newer DOS version, or even the Windows (Windy) version. It's always a good idea to download only from websites you trust and please make sure to do so only with adequate and up-to-date antivirus software running. If you have never played the game and would just like to play it yourself for a bit, you can do so within the DOSBox emulator on this website. It does not run very smooth, but it is certainly playable. CART Racing Headquarters is not involved nor is associated to the following organizations: Indy Racing Series and Indianapolis Motor Speedway. The INDYCAR(TM) trademark is owned by Brickyard Trademarks, Inc., and CART Racing Headquarters is not involved or associated with Brickyard Trademarks, Inc in any way.